Mostly peaceful demonstrations in Paris on Dec. 15 showed that recent concessions by President Emmanuel Macron have quieted – but not satisfied – the outraged French protesters whose weekend marches have gripped and unsettled the country. France’s “yellow jacket” movement began in November with local protests against a planned tax on fuel, mostly in poorer, rural parts of the country. The gas hike is part of Macron’s climate plan to promote electric and hybrid vehicles. Those small demonstrations quickly morphed into an angry, leaderless, nationwide protest movement demanding higher wages, a repeal of the fuel tax and even Macron’s resignation. France’s government seemed stunned by the fury and power of the Yellow Vests. After images of police using tear gas and tanks against protesters in Paris hit newspapers worldwide, French authorities on Dec. 4 suspended the tax. Six days later, Macron gave a contrite speech announcing he would raise the minimum wage and cancel a tax increase on low-income retirees. If Macron cannot assuage protesters’ demands, the consequences will be felt well beyond France’s borders. As a scholar who studies France’s role within the European Union, I believe France’s crisis could infect politics across the entire continent. That’s because Macron’s centrist victory in the May 2017 French presidential election over the far-right Marine Le Pen was widely hailed as a rebuke to the surge of right-wing nationalist leaders who are deeply skeptical of the European Union. Since then, France’s 40-year-old president has consistently presented himself as a defender of the European Union against conservative populists like Hungarian Prime Minister Viktor Orban or Italian Deputy Prime Minister Matteo Salvini. In a much-cited Sept. 2017 speech at the Sorbonne University, Macron outlined an ambitious plan to reinvigorate the European Union with greater cooperation around defense and finance. Support for the bloc has suffered in recent years from far-right nationalist arguments against its policy of open borders and economic interdependence. Only regional integration could dispel the threat of nationalism and protectionism, Macron said. He echoed that warning more recently, in commemorating the 100th anniversary of World War I’s armistice, saying that the rising tide of populism in Europe recalled the 1920s, when fascism arose to threaten democracy across the continent. But if Macron is to safeguard Europe, he must first lead France. This once prosperous, powerful nation has for decades has stagnated economically, diminishing its standing on the world stage. Macron came to power after a meteoric political rise. Though he has never before held elected office, the French president has grand ambitions for his country. During the campaign, Macron promised no less than a “revolution,” pledging to reinvigorate France’s moribund economy, reform its entrenched bureaucracy and restore its global status. His young La République en Marche party secured a large majority in the French parliament, allowing him to quickly push through some major policy initiatives. Within a year, Macron had signed legislation giving greater hiring flexibility in the labor market and overhauling France’s national railway company. 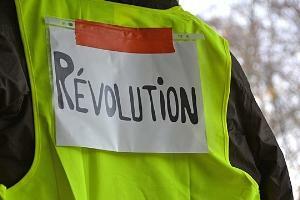 France’s powerful labor unions angrily protested against the measures. But unlike past presidents, Macron was popular enough to withstand their substantial pressure. Remarkably, French public opinion was with the president – not with the workers. That has now changed. Eighteen months after taking office, Macron no longer looks like the golden boy who might actually reform old France. Even before the yellow vest movement erupted, his popularity had been steadily declining. Macron’s approval rating, which stood at 64 percent right after his election, has fallen to just 25 percent.